I never had much affinity with history until, about fifteen years ago, I realised that it is just a story, made up out of a relative small amount of facts, by certain people. Not only are many facts left out of this story, and not only is the story, that we are being taught in school and in the media, just one out of many possible stories, there is something intrinsically wrong with all stories. It can not be told what really was or is. We can experience little parts of Life, but I don’t think that any story that I have ever heard about Life is close to the Truth. Since I tend to forget this, I like to be reminded of it true reading and listening to people talking about the mystery that Life is. On many of the LP’s on which the Mystery of Life is talked about, the known or accepted story is only replaced by another story. Especially Christian preachers are very good at this. I collect LP’s with lectures about the more exotic themes that these preachers address: the devil, the return of Christ, the anti-Christ, numerology, Life in outer space, etcetera. 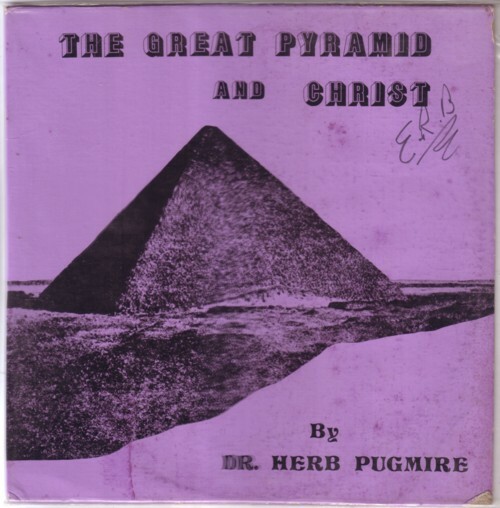 A great LP in this genre is The Great Pyramid and Christ by Dr. Herb Pigmare. On the sleeve it is said that Dr. Herb Pugmire is a veteran of Bible-preaching crusades in eight different countries, and has held city-wide and country-wide evangelistic crusades in many parts of the United States. He is in demand as a speaker at many of the nation’s leading Bible-conferences because of his knowledge of such biblical subjects as Prophecy, Geology, Astronomy, Mathematics, Meteorology, etc. He rends an extra addition to his crusades by personally providing musical renditions on the Cordovox, Melodia, brass instruments and voice. There is no music on this LP, and unfortunately not much talk about the Great Pyramid or Christ either. Dr. Herb Pugmire is mainly doing numerological calculations, which should explain secret meanings of words and names used in the bible. All he really says is that, according to the Bible, Jesus has spent some years in Egypt, and that in the Bible Jesus is referred to as the capstone of the Great Pyramid. Just like Dr. Herb, I am fascinated by the Bible, the origin of the world and the end of time. But I don’t think that we would have a pleasant conversation about these subjects. Here is an excerpt from the LP, about correlations between the amount of words in the Bible and the measures of the Great Pyramid. The Pyramids of Egypt are omitted in the Bible? How is this possible. Hello All, In Isaiah 19, their is a prophecy, that seems to Describes The Six Day War, The Great Pyramid and The Aswan High Dam project, All Major events of 1967. I am no Biblical or Historical Expert But I to find this all very interesting. The Verse relating to the Pyramid is as follows. ‘In that day shall there be an altar (Pyramid) to the LORD in the midst of the land of Egypt, and a pillar (the sphinx) at the border thereof to the LORD. (Isaiah 19:19 KJV). can you put the record on youtube and let us know?